The smaller the housing for power electronics, the easier things become for plant engineers. However, cooling requirements also increase as a result. A CFD simulation helped our customer make a serious commitment to their customers that would have cost them tens of thousands of euros after commissioning. The wishes of our client’s customer were understandable: they wanted to house the necessary electronics in a smaller container. However, since the waste heat amount would remain the same, the cooling requirements would consequently increase. Our customer had asked themselves, “is this feasible?” and trial and error was no longer an option as incorrect dimensioning would only become noticeable after prolonged use on a particularly hot summer day. 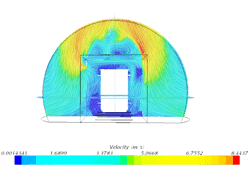 He chose the “insurance” solution – a 3D CFD simulation. This very clearly demonstrated how temperature would be distributed throughout the container and instantly made apparent whether the planned cooling was sufficient. Fortunately and unfortunately: the result of this project was – simply reducing the size of the container would not have been enough. The maximum permissible temperature would have been exceeded if our client had built their system as originally planned. Did the project help him? Of course, because costs can become exorbitant if someone on the other side of the globe has to suddenly correct errors that could have been avoided.